Our American made mini-quartz movements are THE standard in the industry. Whether you are a hobbyist or serious clock maker, we have movements to suit your needs. Perfect for tight spaces and clock hands under 5” long. It runs on one "AA" battery and is accurate to within two minutes a year. This "short shaft press-on" movement is normally installed into cases that already have plastic movement clips as part of the case, or they can also be installed equally well by using a thin double faced tape. Shaft diameter is 3/16" and the shaft length is 1/4”. The absolute thickest dial material than this movement will work with is 3/32” thick. Movement price includes your choice of the two short black pairs of hour and minute hands shown. A black second hand is also included. 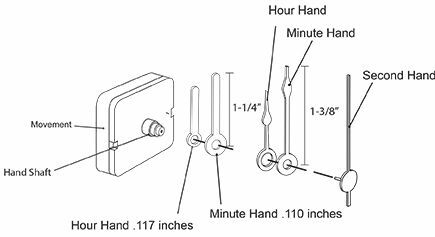 If you wish to use your own hands, please carefully check the clock hand mounting hole sizes shown. These mounting holes are not standardized and they require an accurate measurement. American Made Press-On Shaft - Diameter 3/16"